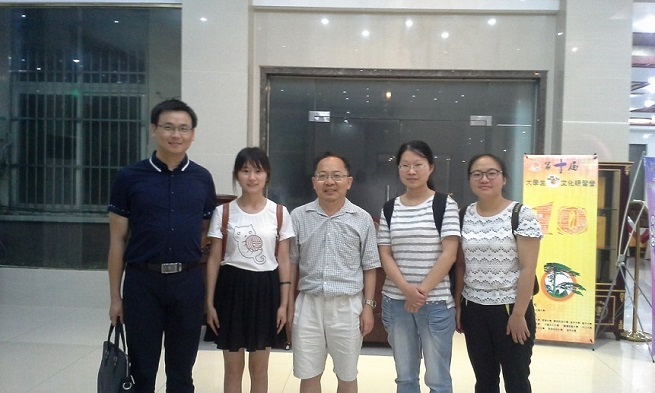 On Thursday July 7th, Mr Hu, Mr.Peng, and I visited three high school graduates at their homes. On Friday, July 8th, I visited He Gong Da and gave a talk there. Afterwards, 4 current and past students we supported came to see and chat with me. Two had to take 40-60 minute bus after work to talk with me (I was touched and felt a little sorry at the same time). We had very pleasant chats and dinner together. This girl was born in 1998 andwill go to a 2nd level university for her college study. She lives with her 87 years old grandma, her disabled mother also with heart problem. To make it worse, his father injured himself when his three wheel vehecle turned over a few years ago (broke 4 ribs). Her father continues to work as hard as possible to support the family. She is an excellent student in her school and helps family during weekend. It was very enjoyable to talk with her. Incidently, her home was between my home village and the middle and high school I went 40+ years ago. The high arc bridge has more than 100 years ago (it does not look high arc anymore due to raising road level for cars).The bridge was typically a rest place when I brought wood or other stuff to town to sell before going to school. A lot of memory about this bridge and this river. This girl was born in 1998 and will go to a three year college for her college study. She is one of the very few poor kids I happened to visit twice at their homes. Her grandma and I recognized each other immediately this time around although this girl and I did not remember each other at all (you see why looking at the two photos). She lost her father at 3 years old (her father was fatally injured 2 months before she was born and lied in bed for almost 4 years). Her mother left and remarried and unfortunately had a son with heart disease at birth. She lives with her mom's mom (ear and leg problem) and mom's unmarried brother (with health problem due to early day brain disease). She also lives with his father's mom (on photos) sometimes. Her father's two brothers sometimes provide some help. Click Her for my Winter 2007 visit of her home. His grandpa died a few years ago after almost 3 years' lying in the bed due to serious Pakinson's disease. Just like llast time, her grandma could not help crying when talking, brought tears to my eyes. This girl was also born in 1998 and will go to a level 2 university likely in Shanghai (medicine) for her college study. Her parents divorced a few years ago, and she lives with her mom at an apartment built in 1985. His father remarried and lives with his new wife and his wife's daughter at a tiny public assitant rent apartment (30 square meters at my best estimate). Her mother has chronicle disease and can not work. During this summer, she worked in the morning and noon at the cafeteria(where her father works) and in the after she tutors an elementary school kid 3 hours for mere 40 Yuan RMB. She does not complain and is very pleasant to talk with. On the day we visited her, her mom's mom is seriously ill so we did the interview at her father's apartment. Gao Shupeng (the man) was among the first we supported although we could not support him in college (due to lack of money at that time). He continues to keep in touch with us and his sponsor Mr Li Chi family. After graduation, he went to Zhe Jiang and back to Hefei (Anhui) to work in contruction industry before moving to finance industry last year. He is always positive and gives advice to other three younger students. He appreciates both the support and the encouraging letters from Li and his wife Yan. 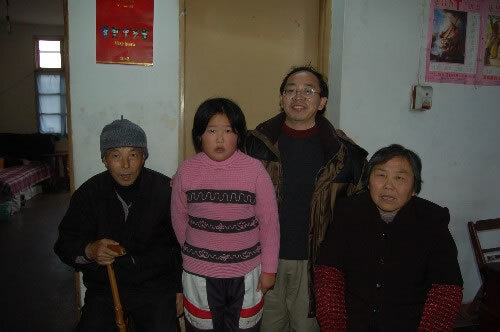 Zhu Yan: Both her older sister (now a graduate student Nanjing Normal University studying law) and She have been supported by us. Both of them appreciate the support very much and started volunteering in college. She is in 2nd year at Hefei Industrial University. 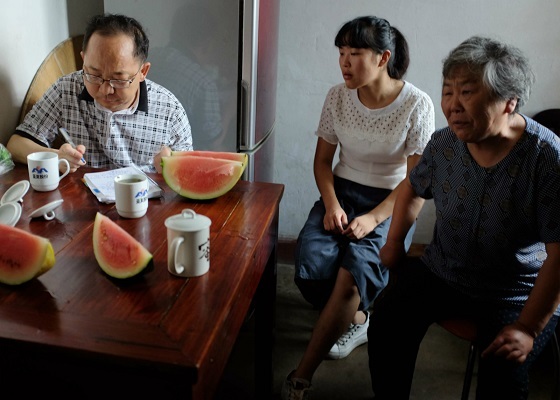 Zhu Jun: a very special case as she does not live in the area we serve. Mr. Hu (our main volunteer) and she met last year at a small charity event co-organized by us and our `sistter' organization, which supported her. During a casual conversation, Mr. Hu noticed her extremely poor and unfortunate family situation. He also liked her positive attitude and decided to chip in with another 1000 Yuan from us to make her situation slightly better. She appreciates this support and gesture very much. She is a 3rd year student at Anhui Medical University and is at a hospital this semester (took her about one hour after work to meet with us). Without generous support of you and others which provide us funds, we would have not been able to support her. Wang Miao: An amazing kid and student. I first met her four years after her frist year college at Beijing Industrial University. She and two other students visited me at Tsinghua during my summer visit there. She peppered me with a lot of interesting and curious questions and left me a very good impression. We continued to be in touch with qq and emails. She started to work part time to support herself during 2nd summer and gave up our support in 3rd college as she can make enough money from part time jobs to make ends meet. She told me that the part time jobs openned up her world and view of the job market. 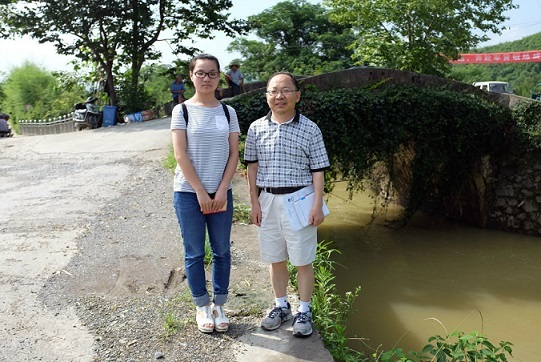 She went to USTC for her graduate study in Chemstry with fellowship from USTC and is writing up her first research paper this summer. She has also been mentoring a poor college student about life and study and has very positive influence on this student (very shy). A coupple of years ago, she visited a poor twins in her home village to wrote a very nice story about it. She is always to volunteer and help.